The New England Journal of Medicine is arguably the best-known and most venerated medical journal in the world. Studies featured in its pages are cited more often, on average, than those of any of its peers. And the careers of young researchers can take off if their work is deemed worthy of appearing in it. But following a series of well-publicized feuds with prominent medical researchers and former editors of the Journal, some are questioning whether the publication is slipping in relevancy and reputation. The Journal and its top editor, critics say, have resisted correcting errors and lag behind others in an industry-wide push for more openness in medical research. And dissent has been dismissed with a paternalistic arrogance, they say. In a widely derided editorial earlier this year, Dr. Jeffrey M. Drazen, the Journal's editor-in-chief, and a deputy used the term "research parasites" to describe researchers who seek others' data to analyze or replicate their studies, which many say is a crucial step in the scientific process. And last year, the Journal ran a controversial series saying concerns about conflicts of interest in medicine are oversimplified and overblown. "They basically have a view that . . . they don't need to change or adapt. It's their way or the highway," said Dr. Eric Topol, director of the Scripps Translational Science Institute and chief academic officer at Scripps Health in La Jolla, California. Topol and another cardiologist were called out by Drazen and his co-authors last year after they wrote an opinion piece in The New York Times saying the data behind a groundbreaking study about blood pressure treatment should be made available to doctors right away - not delayed for journal publication. "Most people are afraid to say anything about the New England Journal because they're afraid they won't get something published there," said Topol, whose last piece appeared in its pages in 2011. "That's part of this oppression." In an interview, Drazen said the recent criticisms are misguided. The goal for the research the Journal publishes is to be accurate, he said, while its editorials are sometimes designed to be "controversial" as a means of triggering discussion. "If there's anything that I have a passion for, it's getting it right," he said. "We work very hard at that. We're not arrogant. We're not dismissive." Brooding over the Journal's future comes at a pivotal moment for medical journals more broadly. Like the larger publishing world, their traditionally slow pace and often imperious control have been jolted by the freedom and brashness of the Internet. So-called open-access journals, which publish online and don't charge for subscriptions, are proliferating, as are websites that allow researchers to post their results before they have been externally vetted. Respected academics, including Harvard's medical school dean Dr. Jeffrey Flier, are calling for fundamental changes in the way research is reviewed and published, even proposing that peer reviewers give up their historic anonymity. This push for transparency tracks the rise of research watchdogs who hunt for evidence of fraud and misconduct, then publicize their findings, often blasting out viral bombs via social media. There's even a popular website called Retraction Watch whose main goal is to flag such lapses, which had largely gone unnoticed even a few years ago. In response, some top journals, including the BMJ, formerly the British Medical Journal, have already begun moving toward more openness in their operations. The BMJ now requires researchers to share the underlying data that forms the basis of their clinical trials, and allows comments on all of its articles, upending the strong hand editors previously had to determine which dissent was worthy of airing. It has even had outsiders examine questions raised about controversial studies. The Journal, in contrast, its critics say, has steadfastly clung to an increasingly antiquated view of medical journals as sole arbiters of what should made be public and whether dissenting views should be heard. "The BMJ wants to take us forward in the new century and the New England Journal of Medicine is trying to take us backwards," said Dr. Vinay Prasad, an expert in evidence-based medicine and an assistant professor of medicine at Oregon Health & Science University. Prasad has become an outspoken critic of the Journal. The publication Drazen inherited was initially launched a quarterly in January 1812 with the less pithy title of the New England Journal of Medicine and Surgery and the Collateral Branches of Medical Science. Today, it is read each week by more than 600,000 people in 177 countries, according to the journal's website. In 1984, the Journal was at the forefront of a nascent effort to respond to the potential bias arising from financial ties between pharmaceutical companies and device makers and physicians. Editor Arnold S. Relman established a new policy, calling on doctors and researchers to disclose their funding and commercial interests. Six years later he went a step further, prohibiting authors with ties to companies from writing editorials or reviews of medical literature relating to their products. Drazen's own ties to the pharmaceutical industry presented something of an obstacle when he was named editor in May 2000. A well-known pulmonologist, he had received money for consulting or research into asthma and its treatments from nine drug companies. Because of those ties, he recused himself for two years from editing or personally selecting any papers related to asthma or to those companies. Two years into his editorship, he loosened the Journal's conflict policy. Drazen wrote that the policy Relman had put in place - and that his successors had affirmed - had "constrained" editors from publishing the best information for doctors. The new policy said authors of editorials and reviews couldn't have "significant" ties to a company, which are defined as receiving more than $10,000 annually from a single business. The Journal dug into the topic again last May with a three-part series questioning efforts to curb financial conflicts of interest among doctors and researchers. "Although, by definition, a conflict of interest represents a risk that judgement will be compromised - not a determination that such a lapse has actually occurred - the pharmascolds' narrative about conflicts of interest often conflates the two," author Lisa Rosenbaum wrote, using a pejorative word some have used to describe those who lament the influence of industry on medical decisions. Drazen's predecessors Jerome P. Kassirer and Marcia Angell, and former senior editor Robert Steinbrook, took to the pages of the BMJ to criticize their former home. "Judges are expected to recuse themselves from hearing a case in which there are concerns that they could benefit financially from the outcome. Journalists are expected not to write stories on topics in which they have a financial conflict of interest," they wrote. "Yet Rosenbaum and Drazen seem to think it is insulting to physicians and medical researchers to suggest that their judgement can be affected in the same way. Asked if the Journal had plans to further revise its policy on conflicts of interest, Drazen said, "We always continually evaluate what we do to make sure we're doing the best job possible." None of Rosenbaum's pieces, he added, "mentioned anything about us changing our policy." Since 2010, ProPublica has written extensively about conflicts of interest in medicine, and has created a tool called Dollars for Docs that allows users to look up payments to doctors by drug and medical device companies. A second tool, Surgeon Scorecard, that includes complication rates, was criticized by Rosenbaum in perspective piece in the Journal last year. Rosenbaum, in an e-mail, said the reaction to the series was much as she had hoped. "One of the primary goals of the series was to start a conversation so that we could move beyond what has become a very reflexive (and typically negative) response to physician-industry interactions," she wrote. Some researchers and doctors have also decried what they perceive as the Journal's resistance to becoming more transparent about the research it publishes. In February, a group of British scientists faulted the Journal, as well as some of its peers, for failing to disclose that the questions being answered in certain studies were not the same as those in the researchers' original protocols. Changes are normal and sometimes to be expected, but they need to be disclosed, the group believes. When the group shared its findings in a series of letters to the editor, the Journal's editors sent dismissive responses, they said, declining to make any changes to the papers or publish the team's criticisms. In an interview, Drazen said his staff initially reviewed a couple of the group's claims, found them without merit and moved on. Through a spokeswoman, he e-mailed documents that he said rebutted the group's contentions regarding two of the studies. "We went through this and it just wasn't worth our effort because it isn't helping the people we're trying to help," Drazen said. A leader of the group, British researcher and author Ben Goldacre, is "trying to sell his books and he's trying to tell the world that clinical trials aren't reliable," Drazen said. Drazen also noted that in recent years, the Journal began posting the protocols and statistical analysis plan for all clinical trials it publishes. Shown the Journal's rebuttals, Goldacre and his team said it not only failed to rebut their contentions, but showed that the editors may not have fully understood the studies' findings and metrics. "There is this whole belief that the scientific literature is rigorous, that things are checked, and that researchers can point out errors post-publication, so the system is self-correcting," Goldacre said in an e-mail. "What we've shown is clear: that doesn't happen, the system doesn't work." The critiques of the Journal have moved onto the pages of competing journals and mainstream news sources, with several recently questioning why it has been slow to correct or clarify studies. A piece last month in the BMJ reported on mounting concerns over the Journal's handling of a major 2012 study that compared the risks of two different products - saline and hydroxyethyl starch - that boost blood volume in critically ill patients. Though the results were not conclusive, the study suggested that starch solutions were more dangerous, leading to a warning from the U.S. Food and Drug Administration and a precipitous drop in sales. The company that manufactured starch solutions wrote a letter skeptical of the study's methodology and results. The Journal, according to the BMJ article, wouldn't correct the article or publish the company's letter. Within days of the BMJ article, the Journal appended a correction to the study about the values in a table, but editors otherwise stood by the findings. In an interview, Drazen said that when concerns are raised about a study, the authors are asked for a response, which is analyzed by statistical reviewers. "Recently we got another query about the same issue," Drazen said. "When we went back to re-query the author, there, in fact, was an error in the paper that was published." Separately, at least one researcher was so troubled at what he viewed as a fundamentally flawed and misleading study in the Journal that he spent five years trying to persuade the Journal to pull it. Dr. Peter Bach, director of the Center for Health Policy and Outcomes at Memorial Sloan Kettering Cancer Center, spotted problems with the 2006 study soon after it was published. The authors said that annual computerized tomography (CT) screenings to detect lung cancer could prevent 80 percent of lung cancer deaths. Critics of the study - and investigative journalists - caused it to be corrected or clarified three times. The first noted that the authors received royalties for inventing CT screening methods that had been licensed to GE Healthcare, a maker of scanning equipment, a disclosure missing from the original study. The second disclosed that one of the foundations that supported the study was underwritten by the Vector Group, the parent company of Liggett Tobacco, which manufactures cigarettes. The third said that certain numbers in the study were wrong, but asserted that the errors did not change the findings. But Bach felt the paper should be further corrected or retracted. He said he communicated his concerns to the Journal's editors but when they didn't act, he submitted them for publication in the Journal of the National Cancer Institute, which published his paper in 2011. Even now, the text of the study continues to contain some incorrect numbers. In order to track the corrections, readers must click on separate links to see the accurate data. If the study is simply printed out, that information is not included. Bach said he fears the study's bad data may continue to have lingering influence. "All the journals should aspire to making sure the scientific record is as accurate as possible, and this was clearly an example where I was able to show empirically that the data was impossible," Bach said. The study's primary author has vigorously defended its accuracy. Journal spokeswoman Jennifer Zeis said in an e-mail that the correction to the data "is prominently and permanently attached to the online article. This correction only resulted in very slight changes to the results and no change to the conclusion and interpretation of the data." Ivan Oransky, who co-founded Retraction Watch in 2010 to track retractions in science in response to their hidden nature, said "Many journals have come to realize or have long realized that correcting the record even with retractions is a sign of health. The New England Journal of Medicine continues to see retractions and even corrections as a badge of shame, and that's a problem." The incident that has provoked the biggest storm came in January, when Drazen and a deputy editor wrote an editorial that some interpreted as critical of burgeoning efforts to share data on clinical research so others can assess the findings and perhaps replicate the analyses. "There is concern among some front-line researchers that the system will be taken over by what some researchers have characterized as 'research parasites,'" Drazen and deputy editor Dan Longo wrote. They defined such people as those "who had nothing to do with the design and execution of the study but use another group's data for their own ends, possibly stealing from the research productivity planned by the data gatherers, or even use the data to try to disprove what the original investigators had posited." The criticism was immediate, fierce and widespread - probably more than for anything else the Journal has done in many years. In an editorial in the journal Science, entitled "#IAmAResearchParasite," editor Marcia McNutt wrote: "No more excuses: Let's step up to data sharing." Barry Marshall, a winner of the Nobel Prize in Physiology or Medicine, tweeted: "Plenty of Nobel prizes came from a new look at other people's data." And Prasad, of Oregon Health & Science University, said despite Drazen's contention that he was reflecting the views of others, the phrase "research parasites" had never appeared in published medical literature before the editor used the term. Drazen quickly published a second editorial in which he appeared to backtrack somewhat (he used the word "clarify"), saying he and the Journal did support data sharing. The worry he was initially trying to articulate, Drazen said in an interview, is that scientists not involved with original research will swoop in, conduct additional analyses (perhaps without understanding the data) and then take credit from those who spent months or years working on the underlying research. "The datasets are very, very, very complex," he said. "You don't want someone to analyze the dataset not fully understanding it." For his part, Drazen said he doesn't see the controversies that have arisen in recent months as any different from those of other periods of his tenure. 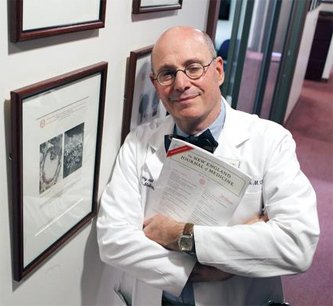 He is one of the longest-serving editors of a major medical journal at this point. "In the 16 years, I can't say that I think this particular last 12 months has been different by a lot," he said. "When issues come up we pay attention to them, and there are always issues coming up." In the interest of full disclosure, the author of this article served on the board of directors of the Association of Health Care Journalists with Oransky.